"This super-simple dip is easy to prepare beforehand and pull out when guests arrive. This dip can be spread on baguette rounds and broiled until lightly golden brown or served cold with tortilla chips, crackers, or crostini. " Place the bacon in a large, deep skillet, and cook over medium-high heat, turning occasionally, until evenly browned and crisp, about 12 minutes. Drain the bacon slices on a paper towel-lined plate. Cool; chop coarsely. 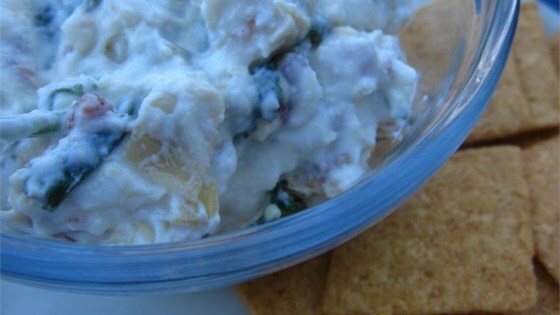 Stir together the bacon, spinach, artichoke hearts, sour cream, mayonnaise, and Parmesan cheese until well combined. Serve immediately, or store in the refrigerator in an airtight container for up to 5 days. Really good! the only thing I will do different is to add garlic and salt next tim. All of my guests agreed that it was delicious but could use more seasoning. Overall it eas a hit.